As part of the Jisc FE Digital Student project we have reviewed published material in both the academic and grey literatures concerned with learners’ experiences and expectations of the digital environment within Further Education and the wider Skills sector in the UK. The search strategy took advantage of traditional academic literature search and informal consultation as appropriate to the sector, looking for UK research published between 2006 and 2014. The review is based on a collection of 8 peer reviewed articles, 23 reports from sector organisations, 25 case studies and 7 unpublished institutional documents. The most striking feature of the Further Education and Skills sector is its diversity – in qualifications, places and modes of learning, and the learners themselves. Some organisations, colleges and lecturers are responding with enthusiasm to the digital age, with many examples of creative uses of technology in the classroom. This diversity of educational contexts, learners and teaching practices combined with little formal evaluation of learners’ experiences, makes it difficult to interpret and learn from the many case studies that are shared in the sector. Our approach has been to make use of frameworks and findings based on trustworthy research and then to illustrate these with stories and quotes from the case studies. The sector reports were largely used to set the research in context. 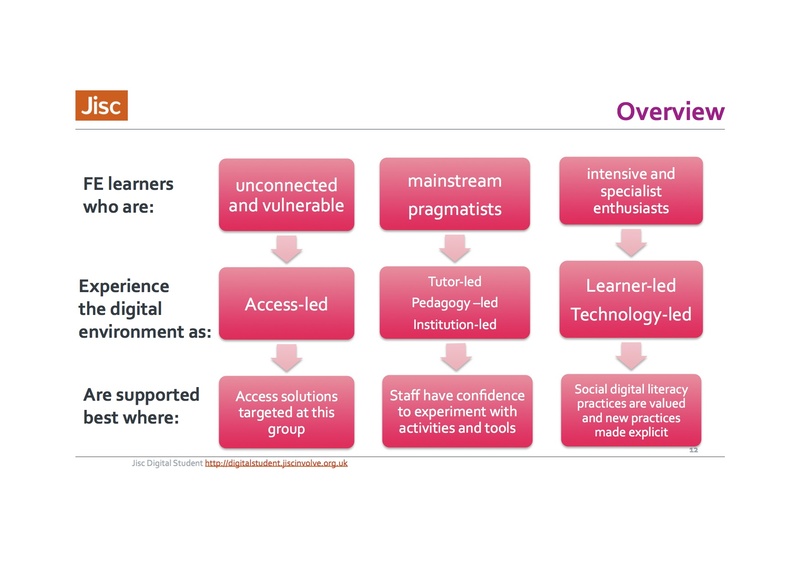 The framework provided by the Becta funded ‘Learners in Their Context’ study is used to understand the findings of the desk study, by considering the experiences and needs of learners across three sections of a spectrum of learner experiences with technology: unconnected and vulnerable, mainstream pragmatists and intensive and specialist enthusiasts. For unconnected and vulnerable learners, their experiences are dominated by issues of access to technology. These learners are best supported where provision is targeted at their access needs, such as by providing mobile devices or personalised solutions for specific access needs. To improve their experiences, provision of technology must be sufficient to meet the access requirements of the vulnerable and technologically isolated. For mainstream pragmatists, their experiences are dominated by issues of pedagogy. This group encompasses the majority of learners whose experience of using technology is influenced to a large extent by the activities designed by their tutors and the environments provided by their institutions. To improve their experiences, staff need to be capable and confident to introduce and use technology in pedagogically appropriate ways. For intensive and specialist enthusiasts, their experiences are dominated by the extent to which they are able to appropriate social and personal uses of technology for learning purposes. To improve their experiences, staff and institutions need to value the skills and practices that learners bring to their educational context. How learners experience their digital environment is influenced by both the rapid changes in technology in society, and the use of technology encouraged in schools. This combination means that learners arrive in FE with the expectation that technology will play an important role in their learning, but unsure of exactly how. In general learners expect course materials to be online, and to be able to access them from a variety of locations and devices. However, they are less clear about the role of technology in supporting independent study (beyond searching for information and improving presentation) and developing skills for work based learning and for the workplace. They need support in the practices they will need to adopt, notably around issues of criticality and self-management. To a large extent, the findings mirror those from previous reviews of students in Higher Education. However, it is noted that ‘unconnected and vulnerable group’ are likely to be a larger proportion of learners in FE and that financial restrictions are a reality for those working and learning in this sector. Learners’ use of technology is also influenced by the distinctive focus in the sector on work based learning. While we noted a great deal of interest from sector bodies in the use of technology to support learning, and on engaging learners in the decisions that are made about this, their reports are not research based. While some colleges have started to conduct their own research, there is little synthesis and dissemination of their findings nationally. Given that learners and their teachers are living in a technology rich environment which is rapidly changing, it is essential that research continues at both the local and the national level to keep pace with changing learner expectations.